History: Tasha was a Grade AA racer. 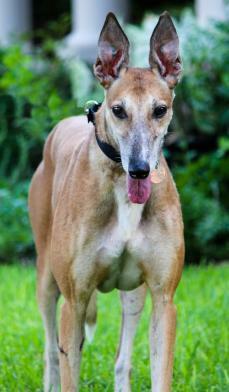 She ran over 130 races and then retired to be a breeding Greyhound. She is now REALLY retired and wants to find her lifetime retirement home. She is very people oriented and extremely affectionate. Like all new dogs, she had a stressful first day. At first it was thought she might be all right with the cats, but after an overnight cat test it was determined that she is too interested in the cats. She should not be adopted into a home with cats or tiny dogs. She seems to like children and dogs that are 16-18 pounds or over. She already goes to the door when she wants to go potty outside. We will learn more about this sweet girl after she settles into a foster home. 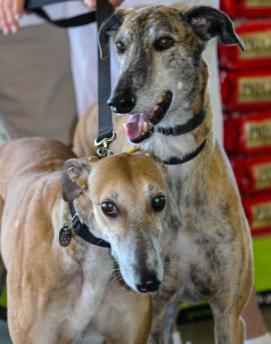 Tasha (now Vixie) with her brother Luki. February 25, 2018 update: Vixie was returned to TAGS due to her families health, she will live in a loving home as a permanent TAGS foster. Her family loves and misses her! 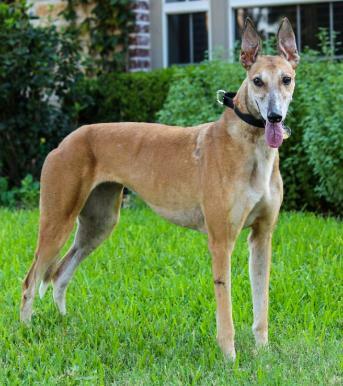 September 8, 2012 update: Tasha (now Vixie) is converting her foster home to her lifetime home with Gail, Ken and greyhound, Luki. 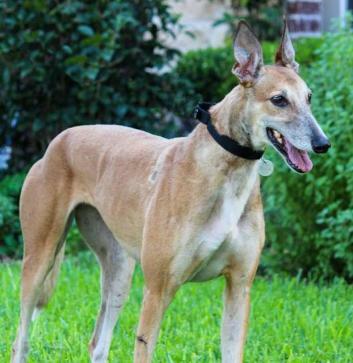 July 22, 2012 update: Tasha's happy tale, aka tail, started with us on her second day after retirement, which was three weeks ago. She entered the house with her sweet loving self and proceeded to inspect if this was what she had been dreaming about. She checked out each person first, then each room and counted all the dog beds and even her crate. What to her surprise was a beautiful dog looking at her in the mirror. She approved the water bowl as it was cool and refreshing. Then it was outside to inspect the yard, and she knew what she needed to take care of. Back inside Tasha chose the dog bed in front of the TV, where the people and other greyhound were, and settled down and went to sleep with an approving huge sigh. Each day she awakens with joy and happiness and acts a few weeks younger. I hope she stops at three --she is almost there. She is never out of the sight of her people and loving us. She cannot get or give enough. Tasha loves her walks and has to tell each stranger, young or old, about her happy life and share some of her love with them. We have not had a problem with other dogs. By the way Tasha loves squeaky toys, and they all have to be on her bed where she can snooze with them. She runs into her crate at night where she sleeps most of the night on her back. We do not crate her during the day when we are gone for a few hours. If you are looking for love, sweetness and fun, you should meet this sweet girl. Come see Tasha. She’ll give you kisses and a ration of love. 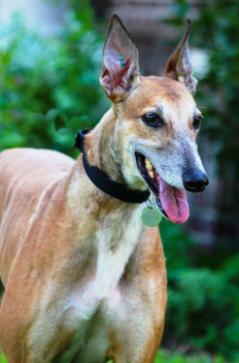 July 2, 2012 update: Tasha came to TAGS to find her loving lifetime home.